The Cougars moved on from Major Applewhite after a late-season collapse. 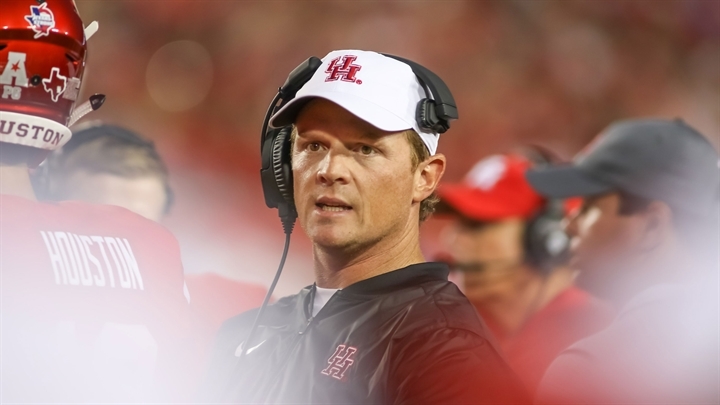 Houston football hired Major Applewhite to continue the successful habits of the Tom Herman era. Just two years in, the administration decided that experiment was a failure. The Cougars lost multiple bad games down the stretch, capped off by an embarrassing 70-14 loss in the bowl game. They lost their starting quarterback before the end of the year, and made more headlines for Applewhite and Ed Oliver’s spat over a jacket than anything on the football field. Now, Houston heads into a new direction under head coach Dana Holgorsen. We’ll have to wait and see whether it was worth it. Here’s our full postmortem and review of the 2018 Houston Cougars football season. Before getting hurt against Tulane in the penultimate game of the year, King looked like a legitimate Heisman contender. In just 10.5 games, King compiled 2,982 passing yards, 674 rushing yards and 50 total touchdowns. His touchdown mark was good enough for No. 3 in program history, even though he missed the bulk of three games. King is in line for a dominant senior season. The obvious answer to this question is the best defensive player in Houston history, Ed Oliver. But with Oliver sidelined for five games, Robinson quickly stepped up and had a strong season. The senior led the way with 127 tackles, 14 tackles for loss and six sacks. He also had five pass breakups, three quarterback hurries and two forced fumbles. Robinson was a huge bright spot on an otherwise disappointing defense. Houston fans had high hopes when the Cougars hired Kendal Briles as offensive coordinator. It’s fair to say the hire went even better than expected. The Cougars went from No. 40 in total offense to No. 7. The scoring offense exploded from No. 65 to No. 5. Three of the four teams that finished ahead of Houston in scoring offense played in the College Football Playoff: Oklahoma, Alabama and Clemson. The ranks were even better before quarterback D’Eriq King got hurt against Tulane. Briles found a way to unlock King, who proved he could be a special playmaker in both the passing and rushing game. After the season, Houston signed Briles to the biggest contract for a coordinator at the Group of Five level. However, Florida State eventually came in and poached him. Applewhite’s inability to hold onto Briles likely had a role in his firing. Houston made some noise early in the year with good performances, but narrowly lost its only marquee game against Texas Tech. A Saturday matchup against No. 21 South Florida was a critical opportunity to build some credibility in the AAC. Things went better than anyone could have expected. King broke away for one of his seven touchdowns on the first drive of the game, and that set the tone. The defense did just enough, forcing five punts, two turnovers and a pair of field goals. With an offense as good as Houston, getting seven stops is more than enough. King finished the game with 419 passing yards, five passing touchdowns, 132 rushing yards and two touchdowns. It was one of the best performances ever by a Houston quarterback, and at home against a ranked opponent. With the win, the Cougars got to 7-1 and started to knock on the door of the national rankings. It was the highest moment of the season. The 2018 regular season came to a disappointing end after losing three late games. Just 15:14 into the Armed Forces Bowl, it became clear that the Cougars’ year was veering towards complete disaster. Houston was favored to beat Army, but quickly fell apart. Army scored two touchdowns in the opening quarter. Sixteen seconds into the second quarter, the Black Knights returned a fumble 23 yards for a touchdown to take a dominant 21-0 lead. It only got worse from there. Here’s a look at Army’s drive chart: touchdown, touchdown, touchdown, touchdown, touchdown, touchdown, fumble, touchdown, touchdown, touchdown. The Black Knights compiled 592 offensive yards, including 507 on the ground. It was a complete embarrassment for Houston, and ultimately led to Applewhite’s firing just a week later. 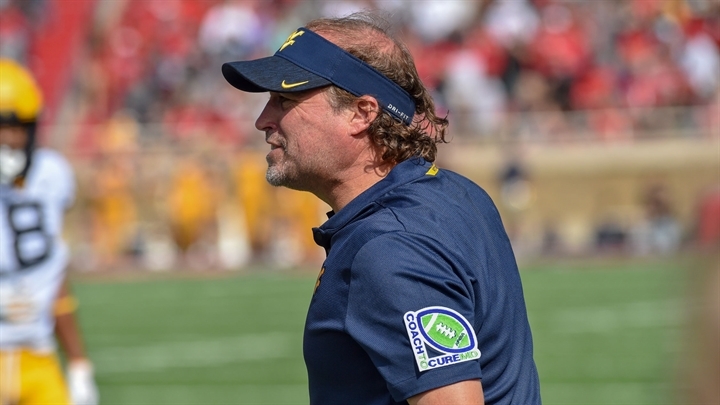 Biggest offseason question: Can Dana Holgorsen reinvigorate a fan base? The salary might not be as eye-popping, but make no mistake – Houston just gave Dana Holgorsen the Group of Five equivalent of the Jimbo Fisher contract. Holgorsen makes $20 million over the course of the contract, and earns more than $1 million more than any other Group of Five coach next year. While fixing the football program is a big part of Holgorsen’s job, engaging the fan base will be just as important. The program remembers just how much the entire university benefitted when Tom Herman led the Cougars to wins over Oklahoma and Florida State, and when U of H won the AAC. This is an investment in the university as much as the football program. Does Holgorsen deserve that kind of credit? We’ll have to wait and see. He led the Mountaineers to a pair of 10-win seasons in power conferences and beat Herman at Texas just last season. He’s coached elite quarterbacks like Geno Smith and Will Grier. There’s a track record of success. Houston can be an elite Group of Five job. Herman proved it. There’s no reason the Cougars can’t compete with UCF every single year for the Group of Five slot in the New Year’s Six. That’s expectations for Holgorsen heading forward. This year should have been Major Applewhite’s triumph. Star defensive lineman Ed Oliver was back, high profile transfers Deontay Anderson and Isaiah Chambers were eligible, and Kendal Briles came in to fix the offense. Through Week 8, the vision seemed to be coming together. But after picking up that signature victory against South Florida, the Cougars completely fell apart. Houston went 1-4 over its final five games. Two of those four losses were against teams that ranked significantly below the Cougars in S&P+. King was out for the final two games, but that’s still no excuse for getting beat by a combined 122-45. Now, Oliver is gone to the NFL. Robinson graduated. Briles is at Florida State. King is coming off a meniscus injury. There aren’t many sure things on this roster. Houston has plenty of talent, and is bringing in an elite Group of Five coach. A rebuild won’t be necessary. Holgorsen committed to the program long term, and he is perfectly interested in competing as soon as possible. But with Oklahoma, Washington State and North Texas on the schedule early in the year, things won’t be easy.